Enterovirus 71 (EV71) is responsible for hand, foot and mouth disease with high mortality among children. Various neutralizing B cell epitopes of EV71 have been identified as potential vaccine candidates. Capsid-incorporation of antigens into adenovirus (Ad) has been developed for a novel vaccine approach. We constructed Ad3-based EV71 vaccine vectors by incorporating a neutralizing epitope SP70 containing 15 amino acids derived from capsid protein VP1 of EV71 within the different surface-exposed domains of the capsid protein hexon of Ad3EGFP, a recombinant adenovirus type 3 (Ad3) expressing enhanced green fluorescence protein. Thermostability and growth kinetic assays suggested that the SP70 epitope incorporation into hypervariable region (HVR1, HVR2, or HVR7) of the hexon did not affect Ad fitness. The SP70 epitopes were thought to be exposed on all hexon-modified intact virion surfaces. Repeated administration of BALB/c mice with the modified Ads resulted in boosting of the anti-SP70 humoral immune response. Importantly, the modified Ads immunization of mother mice conferred protection in vivo to neonatal mice against the lethal EV71 challenge, and the modified Ads-immunized mice serum also conferred passive protection against the lethal challenge in newborn mice. Compared with the recombinant GST-fused SP70 protein immunization, immunization with the Ads containing SP70 in HVR1 or HVR2 elicited higher SP70-specific IgG titers, higher neutralization titers, and conferred more effective protection to neonatal mice. 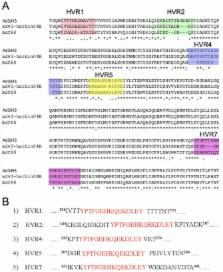 Thus, this study provides valuable information for hexon-modified Ad3 vector development as a promising EV71 vaccine candidate and as an epitope-delivering vehicle for other pathogens. Enteroviruses can cause outbreaks of hand-foot-and-mouth disease (characterized by vesicular lesions on the hands, feet, and oral mucosa) or herpangina, usually without life-threatening manifestations. In 1998 an epidemic of enterovirus 71 infection caused hand-foot-and-mouth disease and herpangina in thousands of people in Taiwan, some of whom died. We assessed the epidemiologic aspects of this outbreak. Cases of hand-foot-and-mouth disease or herpangina in ambulatory patients were reported to the Taiwan Department of Health by a mean of 818 sentinel physicians. Severe cases in hospitalized patients were reported by 40 medical centers and regional hospitals. Viruses were isolated by 10 hospital laboratories and the department of health. The sentinel physicians reported 129,106 cases of hand-foot-and-mouth disease or herpangina in two waves of the epidemic, which probably represents less than 10 percent of the estimated total number of cases. There were 405 patients with severe disease, most of whom were five years old or younger; severe disease was seen in all regions of the island. Complications included encephalitis, aseptic meningitis, pulmonary edema or hemorrhage, acute flaccid paralysis, and myocarditis. Seventy-eight patients died, 71 of whom (91 percent) were five years of age or younger. Of the patients who died, 65 (83 percent) had pulmonary edema or pulmonary hemorrhage. Among patients from whom a virus was isolated, enterovirus 71 was present in 48.7 percent of outpatients with uncomplicated hand-foot-and-mouth disease or herpangina, 75 percent of hospitalized patients who survived, and 92 percent of patients who died. Although several enteroviruses were circulating in Taiwan during the 1998 epidemic, enterovirus 71 infection was associated with most of the serious clinical manifestations and with nearly all the deaths. Most of those who died were young, and the majority died of pulmonary edema and pulmonary hemorrhage. First isolated in California, USA, in 1969, enterovirus 71 (EV71) is a major public health issue across the Asia-Pacific region and beyond. The virus, which is closely related to polioviruses, mostly affects children and causes hand, foot, and mouth disease with neurological and systemic complications. Specific receptors for this virus are found on white blood cells, cells in the respiratory and gastrointestinal tract, and dendritic cells. Being an RNA virus, EV71 lacks a proofreading mechanism and is evolving rapidly, with new outbreaks occurring across Asia in regular cycles, and virus gene subgroups seem to differ in clinical epidemiological properties. The pathogenesis of the severe cardiopulmonary manifestations and the relative contributions of neurogenic pulmonary oedema, cardiac dysfunction, increased vascular permeability, and cytokine storm are controversial. Public health interventions to control outbreaks involve social distancing measures, but their effectiveness has not been fully assessed. Vaccines being developed include inactivated whole-virus, live attenuated, subviral particle, and DNA vaccines. Copyright © 2010 Elsevier Ltd. All rights reserved. Neurological manifestations of enterovirus 71 infection in children during an outbreak of hand, foot, and mouth disease in Western Australia. Enterovirus 71 (EV71) causes epidemics of hand, foot, and mouth disease associated with neurological complications in young children. We report an outbreak of EV71-associated neurological disease that occurred from February through September 1999 in Perth, Western Australia. Fourteen children with culture-proven, EV71-induced neurological disease were identified. Nine patients (64%) developed severe neurological disease; 4 of these patients developed long-term neurological sequelae. Neurological syndromes included aseptic meningitis, Guillain-Barré syndrome, acute transverse myelitis, acute cerebellar ataxia, opso-myoclonus syndrome, benign intracranial hypertension, and a febrile convulsion. Clinical and magnetic resonance imaging data indicated that immunopathology was a major factor in the pathogenesis of neurological disease in this outbreak. This finding is in contrast to reports of previous EV71 epidemics, in which virus-induced damage to gray matter was the most frequent cause of neurological disease. Conceived and designed the experiments: RZ XS XT. Performed the experiments: XT XL HL TL ZZ TZ. Analyzed the data: XT RZ. Contributed reagents/materials/analysis tools: XL HL. Wrote the paper: XT. This work was supported by the National Nature Science Foundation of China (NSFC, 31070150), the Nature Science Foundation of Guangdong (10151009504000006) and School of Guangzhou Research Projects (10A006D). The funders had no role in study design, data collection and analysis, decision to publish, or preparation of the manuscript. Antigenicity, animal protective effect and genetic characteristics of candidate vaccine strains of enterovirus 71. Immunity to avirulent enterovirus 71 and coxsackie A16 virus protects against enterovirus 71 infection in mice.